You are here: Home / Entrepreneurship / VentureLab Twente for high-ambition techno starters ! VentureLab Twente for high-ambition techno starters ! If you want to start your own high-tech, high-growth business, than VentureLab Twente might be a good way to realize your ambitions as entrepreneur. VentureLab Twente is a combined project of: (1) University of Twente; (2) Nikos, Dutch Institute for Knowledge Intensive Entrepreneurship; (3) Saxion Hogescholen; (4) Kennispark (“Knowledge Park”) Twente. Yesterday VentureLab Twente organized a meeting on the High Tech Campus in Eindhoven, to present the concept, the model and underlying rules & assumptions. 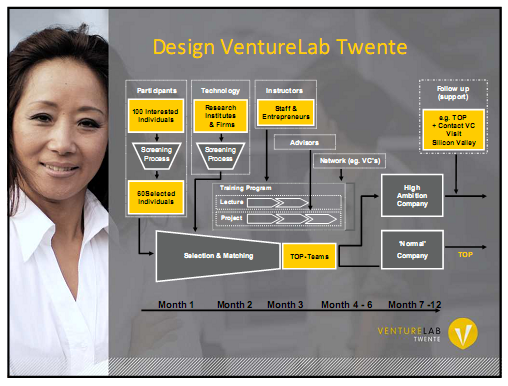 The figure below provides a schematic overview of the design of VentureLab Twente. However the “entrepreneurial” University of Twente has more than 25 years of experience in this field, and there are parts of the VentureLab program already running in a stand-alone setting. The percentages are therefore based on best practices and experience. Furthermore VentureLab Twente provides every nessesary support for techno-starters, which should result in this high survival rates. (Corporate) Entrepreneurship might also be a good form for developing new innovations in the market, and could be a way of thinking to deal with the current problems as the result of the financial crisis. If you are an entrepreneur-with or without an idea-, please check out the website and register there for one of the informational meetings or apply directly to the VentureLab Twente program. With Aard Groen as main driver of this project, and on of the most inspiring people within the School of Management and Governance Faculty this project should become a huge succes, both in terms of practical outcomes as well as contribution to scientific theory. Entrepreneurship might also be a good form for developing new innovations in the market, and could be a way of thinking to deal with the current problems as the result of the financial crisis in the modern market. Hey!, I found this information for you: "VentureLab Twente for high-ambition techno starters !". Here is the website link: https://www.remo-knops.com/543/venturelab-twente-for-high-ambition-techno-starters/. Thank you.